Irreverent and irrelevant ramblings of a food, wine and fashion junky | Good food; Good wine; Good times. 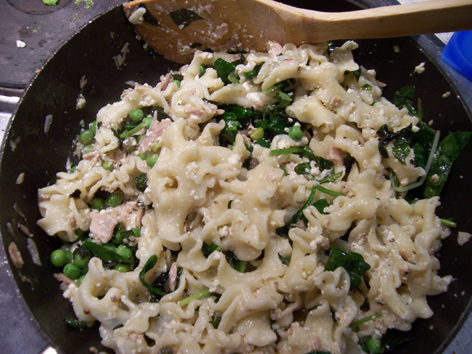 Fresh Ondule pasta with tuna, lemon and ricotta. This was such a treat. I got the pasta fresh at an Italian Deli in Leederville, Western Australia called the Re Store. It is a type of long ribbon pasta however the edges are crinkled enabling it to hold onto the sauce wonderously. For this I made my own ricotta cheese (recipe to come) which just sent an already lovely dish over the top. It also can be assembled from just what you have lying around in the pantry. In a sautee pan, gently fry the onion in a good slurp of olive oil (around 2 tablespoons) on gentle heat, until transparent. Add the tuna and peas, and cook until the peas are just turning bright green. Add the pasta, lemon, capers and ricotta and gently fold through all ingredients, being careful not to “cream” the ricotta too much. Season with salt and pepper. Once warmed through (1-2 mins) remove from the heat, fold through the basil and serve immediately. Serves 1 as a main course, 2 as a starter. Calories: approxmately 400 in a main course serve. 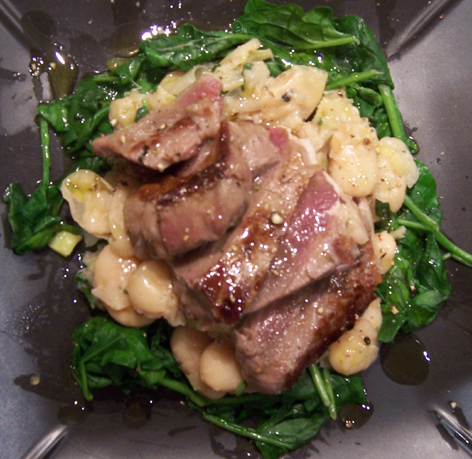 This wonderful dish would work so well with either a lighter red or a full-bodied white wine. Sinclair wines in Manjimup, Western Australia produce fabulous wines and their Sauvingion Blanc would be perfect with this meal. Great meal; quick to prepare. In a sautee pan, gently fry the garlic in a little oil until just transparent. Add the ginger and other dried spices and stir until the spices become fragrent (1-2 mins). Add the yoghurt and chutney and stir to comine. Season with salt, to taste. 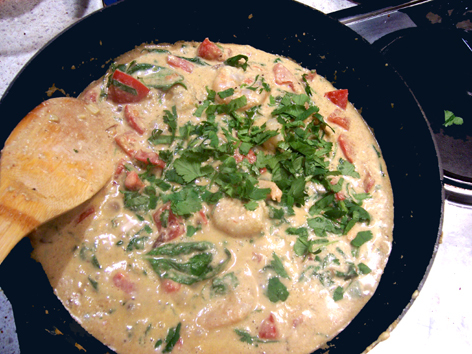 Add the prawns, cream and tomatoes and cook for 2 mins over medium heat. Add the spinach and cashews and stir for a further minute or so. Once the spinach has wilted, stir in the coriander and serve immediately. Serve over steamed jasmine rice. Serves 2 as a main course; 4 as a starter. Approximately calories per main course serving: 400, which includes a small (1/3 cup) serve of jasmine rice. Absolutely delicious with red or white wine, or beer. choo-chee is a style of thai curry similar to red curry but milder and sweeter. It works especially well with fish or prawns and this dish is simply a wonder. Blanch the beans in boiling water for 2-3 mins, then drain well. In a frying pan, fry the fish over high heat, around 1 min on each side just to brown the fish off. Set aside. In the same pan, fry the onion over medium heat until just wilted. Add the curry pastes and fry off for 30 sec. Add the coconut milk and other ingredients. Bring to the boil and taste for flavour. If desired, add more lime or more sugar. When sauce tastes as desired, add fish back in and stir through. Add the beans and cook for 2-3 mins, stirring to incorporate all the ingredients. Serves 1 as a main or 2 as an entree. Absolutely lovely. Calories – approximately 400 per serve. 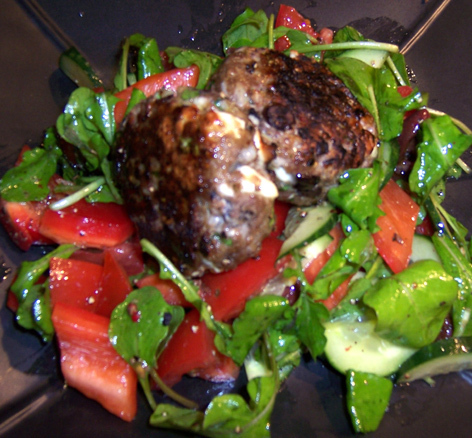 Lovely rissole recipe which would equally work for burgers or meatballs that could then be served with pasta. As with all mince recipes, get the leanest, best mince possible. Lamb mince would be a wonderful substitute for beef. Combine all ingredients in a bowl and mix to combine. Form mixture into large round balls and flatten to form rissoles. Fry or barbecue rissoles over medium-high heat for ~3-5 minutes on each size, depending on the size. Serve immediately. 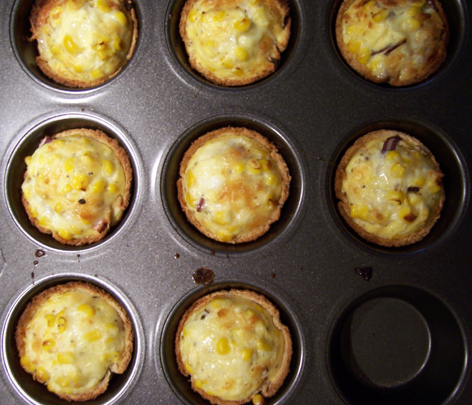 I served these with a mixed salad (as pictured). Makes approximately 4-5 rissoles. Calories per rissole – approximately 180. I was inspired to make this dish from watching re-runs of season 2 of Top Chef, specifically the second episode of the season where they cater the Asian themed event for 1000 people. Team Korea make a braised pork dish that looked delicious and I was inspired to try and re-create it. Combine the garlic with the dry ingredients. Rub the sliced pork pieces in the spice mix and set aside. Leave for 1 hour minimum. In a saute pan, fry the apple, pear and onion in oil over medium heat. Add the ginger, apple juice, stock and sugar. 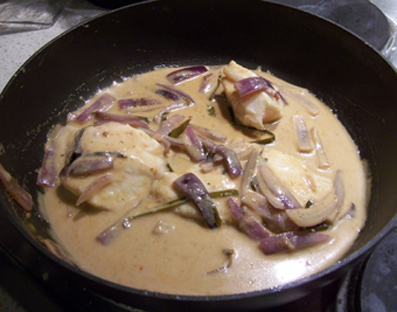 Simmer until sauce has reduced slightly and pear/onion mix is thick and flavourful – approximately 30 mins. Season with salt and pepper to taste and retain on low heat. In a frying pan, fry the pork over high heat in oil until browned – 1-2 mins. Remove from heat and add to the pear mixture, folding the pork through the apple/pear to combine the flavours. Cook for 5 mins over medium heat and serve immediately. This absolutely delicious meal serves 2 as a main course. Serve over steamed white rice.